Human IL-1RL1, His Tag (IL1-H5229) is expressed from human 293 cells (HEK293). It contains AA Lys 19 - Phe 328 (Accession # Q01638-2). The protein has a calculated MW of 36.9 kDa. The protein migrates as 48-60 kDa under reducing (R) condition (SDS-PAGE) due to glycosylation. 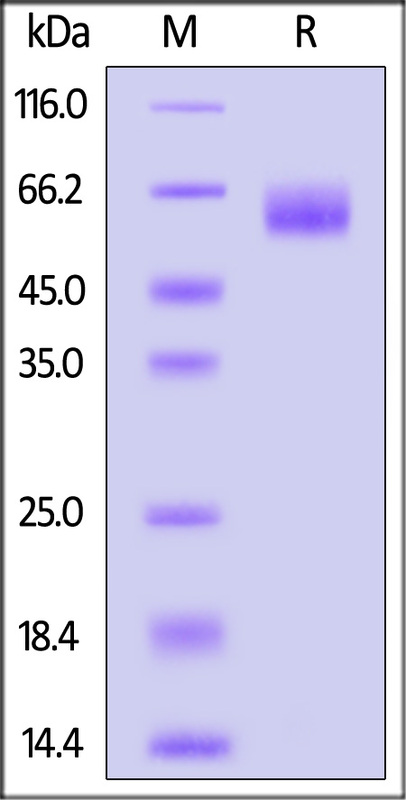 Human IL-1RL1, His Tag on SDS-PAGE under reducing (R) condition. The gel was stained overnight with Coomassie Blue. The purity of the protein is greater than 90%. 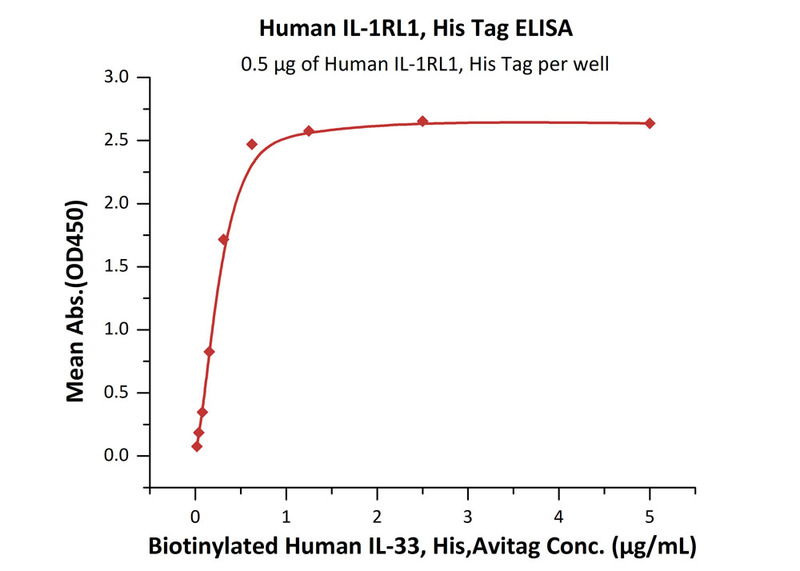 Immobilized human IL33 at 5 μg/mL (100 μL/well) can bind Human IL-1RL1, His Tag (Cat. No. IL1-H5229) with a linear range of 0.125-0.5 μg/mL (QC tested). Interleukin 1 receptor-like 1 (IL1RL1) is also known as ST2, DER4, FIT-1, IL33R, ST2L, ST2V, which belongs to the interleukin-1 receptor family. IL1RL1 contains three Ig-like C2-type (immunoglobulin-like) domains and one TIR domain. IL1RL1 is receptor for interleukin-33 (IL-33), its stimulation recruits MYD88, IRAK1, IRAK4, and TRAF6, followed by phosphorylation of MAPK3/ERK1 and/or MAPK1/ERK2, MAPK14, and MAPK8. IL1RL1 possibly involved in helper T-cell function. IL1RL1 can interact with MYD88, IRAK1, IRAK4, and TRAF6. (1) Tago K., et al., 2001, Biochem. Biophys. Res. Commun. 285:1377-1383. (2) Schmitz J., et al., 2005, Immunity 23:479-490.